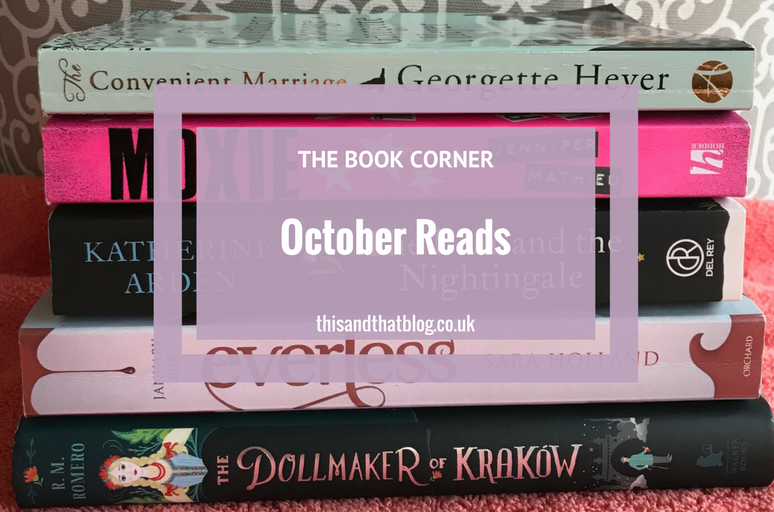 Greetings team and firstly an apology, I’ve kept you waiting almost two weeks for my October reads post! Eek how remiss of me. I’m sorry. I blame the new job craziness for that. But hopefully you’ll forgive me and dive straight in to today’s post, it’s a good ‘un after all. It’s my October reads update. 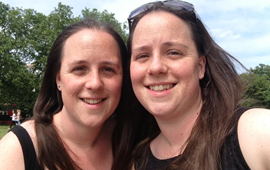 Hooray – who doesn’t like talking books?! I love Georgette Heyer’s novels and I think she’s incredibly underrated. Her books are the perfect mix of funny and heart-warming, with a little bit of the ridiculous thrown in. They’re basically like a warm hug. Maybe that’s why I see them as very autumnal reading, despite the cover look. Anyway I’ve not really read enough of her books so when Autumn began to show its colours I dove in to The Convenient Marriage. It’s a ridiculous story, full of silly characters and you can see what’s coming a mile off. But it’s still a really good read and I found myself snort-laughing a couple of times so I’d highly recommend you read it if you haven’t! I’ve heard a lot of good things about Jennifer Niven’s books but this is the first that I’ve read and it didn’t disappoint. I liked that Niven’s character’s seemed fully formed and flawed – they weren’t perfect teens using adult language. They were simply real teens, dealing with real issues in the way that I’d expect them too. The main character of Holding up the Universe, Libby, is such a brilliant character and I found her so inspiring. I wish I’d read about her as a teen myself – I could have done with some of her wise words. So yes, this is the first time I’ve read this classic. For some reason it never appealed before now and the two other times I’ve tried to read it I just couldn’t get into it so I gave up. But this time when I picked it up I was in love straightaway. Something about the writing just clicked this time – maybe because I had time to ponder and enjoy it. Whatever the reason I loved To Kill A Mockingbird and I can totally see why people adore this book. It’s so beautifully written and the characters are so interesting. It’s worrying that the themes of this book still resonate so much now, but perhaps that’s why people love the book so much. This kids book is so gorgeous, the cover doesn’t quite do justice to the beautiful insides. It tells the tale of a doll that finds herself transported to 1930s Poland to life with a lonely dollmaker. There they befriend a young Jewish girl and her father just as the second world war breaks out. The Dollmaker of Krakow is a beautiful mix of magic and hope, horror and love and I raced through it. It’s simply beautiful. This tale of witches and magic all set in Elizabethan London is such a good read. The world Bowling has imagined in Witchborn is so interesting, taking the view that Mary and Elizabeth were both witches – one good and one evil – and that the court was all involved in it too. The story sees two children traversing across a familiar London meeting all sorts of interesting people as they try to save one mother at the same time as learning about the secrets the other mother was keeping. I was left guessing about the big reveal right until the end. It really was an excellent read. The Bear and the Nightingale is perhaps my book of the year! It’s set in the wilds of Russia and so was perfect for reading as autumn arrived – the snowy wilderness seemed suitable for an October read. The book tells the tale of a young girl who sees spirits that no one else can see. Over the years these spirits have protected the village thanks to the villagers’ superstitions. However when a new priest arrives spewing a philosophy of fear of spirits and things that are different the spirits start to neglect their duty and the village is in danger of an evil lurking just beyond the village. Vasilisa is the only one who still believes in the spirits’ power and she’s left to single-handedly save the village. This book is hauntingly beautiful and the writing is so lyrical. Once you’ve started it you won’t be able to put it down. The world that Katherine Arden has created is so brilliantly imagined – I genuinely felt like I was in the Russia forests – and it feel so real. Moxie is an incredible book and is so relevant to what’s happening in the world right now. It’s an empowering read and should be essential reading for teenagers across the country – I certainly could have done with it while at school. It’s about a girl who starts a feminist movement at her school without meaning too. She starts a zine in response to how the teachers are treating the girls – penalising them for distracting the teachers and boys by what they’re wearing – and making the football team out to be godlike, despite their hideous way of treating girls. Little does she realises others are feeling the same way and she starts a movement that inspires others and changes her world. Genuinely everyone should read this book. Everless is the last of my October reads and is book one in a brilliant new YA series about a world where time is in people’s blood and the rich can buy blood and time in order to life longer. The poor must sell there blood in order to survive, although of course not for long as they’re shortening their life each time they sell their blood or time for money. This is such an intriguing concept and it’s brilliantly written. Our main character, Jules, is clearly morally good, despite the secrets hinted at in her past. She ends up working at Everless, the estate of the cruel, ruling family and while there, trying to save her family, she uncovers more about her mysterious past. There is, of course as per all brilliant YA, a mini love triangle, but that’s not the key part of the story. In fact it’s almost incidental. Basically this is a brilliant series that you’ll want to get stuck into asap when it’s out in the new year. Although be warned it’ll keep you guessing right until the end! 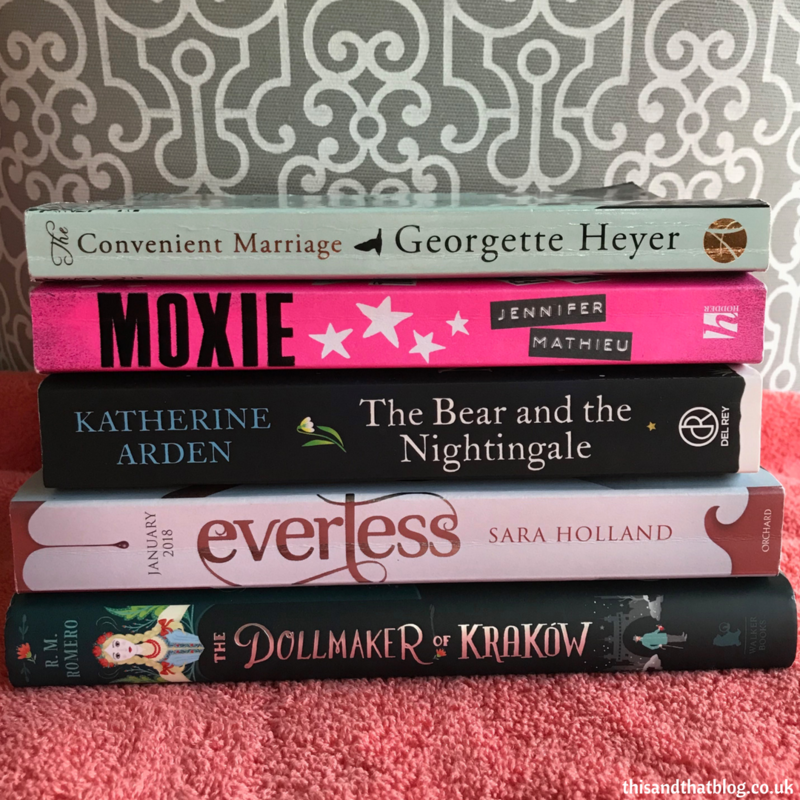 So there we go, my October reads are finally up on the blog! Have you read any of these books? If so which were your favourites?